Engage: Knowledgeable, professional, competitive Stargel Consultants work closely with the client to uncover potential inefficient, unproductive and costly document workflows. Analyze: Stargel Consultants share data with our team of experts that analyze and collaborate to build a winning strategy for the client. Deliver Superior Solutions: Our team of experts collaborates with the client to provide superior solutions to improve document workflows. Implement: Superior solutions are implemented in the client environment and monitored by an award-winning service team to ensure maximum productivity and efficiency. 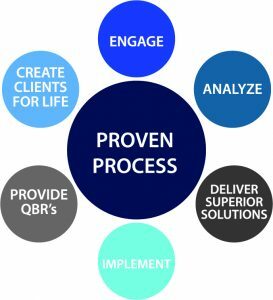 Provide Quarterly Business Reviews (QBRs): Clients are provided a dedicated QBR Consultant that assists the Stargel Consultant and provides benchmark tracking to ensure efficient document workflows remain in place. Create Clients for Life: The Stargel goal is 100% client satisfaction to ensure lasting partnerships that share experiences with potential new clients.